After an hour of driving west out of Melbourne, a kids toilet stop and a wrong turn…we arrived. Four year old Amelia looked delightful! She had my Akubra hat perched high on her head, as we arrived Fox Lillie Offices, Melton, with thirteen year old Billy by our side. Amelia and Akubra in stride. She can’t help it. It’s in her blood. This entry was posted in Wool Sales and tagged fox lillie, nelyambo, Organic, wool on January 22, 2012 by ruralorg. Janie with Geoff Redden from Elders Premier Wool. Behind every successful woolgrower is a specialist team. 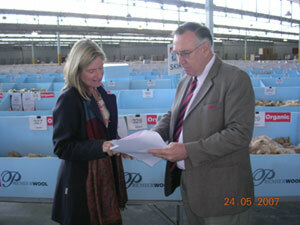 On Thursday 24th May 2007, Elders Ltd held Australia’s largest ever organic wool sale in Melbourne. This entry was posted in Wool Sales and tagged certified, elders, sale, wool on May 30, 2007 by ruralorg.